SINOPEC Fujian Refining & Chemical Co.,Ltd. Fujian Petrohemical Company Limited(FPCL) is located in Quangang District, Quanzhou, Fujian Province, near the well-known Meizhou Bay in the southeast coast of China. It has a very convenient communication of marine, land and air. It covers an area of 2.74 square kilometers. The company (Its predecessor is Fujian Refinery) is a joint venture established in January 1989 between SINOPEC Corp. and Fujian Province. BASF-YPC Company limited is a 50:50 joint venture between BASF and SINOPEC with a total investment amounting to USD 2.9 billion, is to build and operate an integrated petrochemical site（IPS） in the reserved development zone of Yangzi Petrochemical Company （YPC）, Nanjing, PR China. BASF-YPC Company Limited is the first joint venture completing the approval process based on integrated petrochemical project and is also for the moment the largest Sino-German joint venture company in China. Shanghai Secco Petrochemical Co., Ltd is a 30/20/50 equity Joint Venture by China Petroleum & Chemical Corporation, Sinopec Shanghai Petrochemical Company Limited, BP Chemicals East China Investments Limited. Incorporated in November 2001, the Company is set out to build an internationally competitive petrochemical enterprise, which will manufacture and market high quality petrochemical products, replacing imports and meeting the increased . SINOPEC QILU Company, located in Zibo city, Shandong province, was first established in 1966, which covers an area of 5.18 km2. It’s composed of the following units such as Refinery Plant, 1st Fertilizer Plant, 2nd Fertilizer Plant, Storage & Transportation Plant, Acrylic Fibers Plant, Sales & Transportation Department, Supplying Company and Research Institute. The main business of QILU is petroleum refining and production, sales and storage of petrochemical, chemical fiber and other chemical products. SINOPEC Jinling Company is one of the largest petrochemical complexes in China, mainly engaged in crude refining, processing and marketing of petrochemical products. SINOPEC Jinling Company operates totally 40 large-scale production complexes such as Refinery, Chemical Fertilizer Plant and Thermal Power Plant, and 4 specialized companies and institutions that are engaged in R & D information, trading and fire brigade. The Chemical Fertilizer Plant has a nominal production capacity of 300,000 tons of synthetic ammonia and 520,000 urea per year. The Branch is a large-scale petrochemical enterprise established in April 2000 from SINOPEC Tianjin Petrochemical Co. after the restructuring its main business and improving the mechanism. Sinopec Baling Company (Hereafter abbreviated as Baling Company) is an enterprise directly affiliated to China Petroleum and Chemical Corporation .SINOPEC Baling Company is founded in April 2000, based on the merge of former Dongting Nitrogen Plant and Yingshan Petro-chemical Plant. In May 2002, at the instruction of China Petrochemical Corporation, Baling Company separated with Baling Petrochemical Corporation. SINOPEC Changling Company, (hereinafter called Changling Company ) is situated in Yueyang city, alongside the Dongting Lake and the south bank of the Yangtze River, nearby the Beijing-Guangzhou railway and adjacent to the 107th national highway and Beijing-Zhuhai expressway, so it commands both land and water traffic facilities . The main chemical industry unit is the 70,000t/a Polypropylene (PP) unit which can produce 25 brands of PP products. China Petroleum & Chemical Corporation Guangzhou Company (hereinafter referred to as "Sinopec Guangzhou Company") is one of the leading modernized petrochemical enterprises in South China. Situated in Huangpu District, Guangzhou City, the centre of the Pearl River Delta where economy has been growing rapidly, Sinopec Guangzhou Company is adjacent to Hong Kong and Macao and has excellent land and water transportation facilities, with the Guangzhou-Shenzhen Expressway being in the north, and the Guangyuan East Freeway, the Guangzhou-Shenzhen Railway and the Huangpu Port lying in the south. A：70KT,　B：40KT (up to 60KT after revamp). Sinopec Anqing Company (hereinafter referred to as Anqing Company), occupying an area of 10 square kilometres, is situated on the northwestern outskirts of Anqing City, Anhui Province. Lying on the northern bank of the lower reaches of the Yangtze River, Anqing City enjoys an extremely convenient communication network complete with sea (the Yangtze River golden watercourse), ground and air traffic facilities. 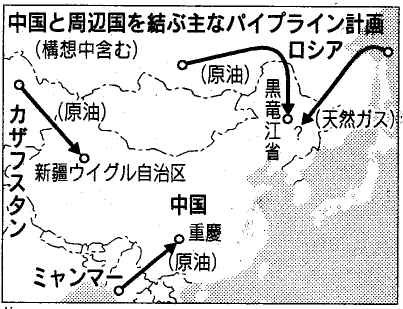 By the Beijing-Kowloon Railway, you can get up to Beijing & Tianjing and down to Guangzhou & Hongkong, and by the Yangtze River, reach Hubei & Sichuan Provinces to the west and Nanjing & Shanghai to the east, rendering Anqing Company more competitive in its future development. SINOPEC Jingmen Company (hereinafter referred to as Jingmen Company ) is located in Jingmen, the central zone of Hubei province, China. It lies south to Jingzhou and by Yangtze River. To the south are Xiangfan and Hanjiang River. Wuhan, capital city of Hubei province locates in the east. To the west stands the Three Gorges, and it leads to Yunnan and Guizhou province. In possession of the geographical advantages, Jingmen is in a convenient transportation network both on land and waterway. SINOPEC Jiujiang Company , (hereinafter referred to as the Company) is located in the eastern suburb of Jiujiang City, on the northern bank of the Yangtze River, to the south of Mountain Lushan and to the east of Boyang Lake, It covers the area of 4.2 square km. It is the only large scale petrochemical enterprise in Jiangxi Province. It has excellent geographic advantage and therefore has convenient transportation facilities. Its plants are only 1km away from the Yangtze River. Chemical units in the Company consist of 300,000TPY ammonia unit, 520,000TPY urea unit and 100,000TPY PP unit. SINOPEC Hubei Chemical Fertilizer Company is located in Zhijiang City the western part of Jianghan Plain Hubei province. To its south is the Changjang River, it is adjacent to a famous city Yichang, and the Three Gorges International Air Port in the west and neighboring an ancient city Jingzhou in the east, and has the Yichang-Huangshi expressway passing through it. It is favorably endowed with good energy resources, transportation and tourist conditions. It has a dedicated railway transport line which are linked by the railways throughout the country. Its products can be transported nationwide by river, railway, highway and airway. Sinopec Jinan Company (hereinafter referred to as Jinan Company) is in Lixia District of Jinan City, Shandong Province. The company is located between Shengli and Zhongyuan Oil Fields with a private railway connecting to Jiaoji Railway. Its plant area is next to Jiwang Highway and Jiqing Expressway respectively in the north and south. It has very good geographical conditions with very convenient traffic. SINOPEC Wuhan Company was founded on Feb 28th, 2000 during the restructuring of SINOPEC Wuhan Petrochemical Works, mainly engaged in petrochemical processing and some petrochemicals production. Gaoqiao Branch is subsidizing an oil product research institute and a chemical research institute, dedicated to the development of new brands of lube oil and chemical products. More than 100 research & study achievements have been awarded with prizes for science & technology progress and/or new products by state, Shanghai Municipality or SINOPEC. The products manufactured in compliance with international standards or advanced foreign standards account for 77% of regular produced brands. Gaoqiao Branch has been operating several joint ventures with world famous oil and chemical companies including German's BASF, America's Caltex, Swiss's Ciba-Geigy and Japan's Mitsui Alkyl Phenol etc. Currently the Branch is taking an active part in the development and construction of Shanghai Chemical Industrial Park (SCIP), a phenol/acetone plant of 20,000T/A capacity is now under construction, while co-operation intentions are discussed with other multinational chemical companies for other projects including styrene-butadiene rubber, ABS resin etc. During 1983-2003 SINOPEC has stood the test in the reform of state-owned enterprises and the upsurge of the market economy and achieved a historic leap forward. BP announced today that it has concluded the placing of its entire 2.1 per cent stake in China Petroleum and Chemical Corporation (Sinopec), announced earlier today. BP has agreed to sell its stake of around 1.8 billion 'H' shares in Sinopec at a price of HK$3.15 a share, raising a total of approximately HK$5.8 billion (US$742 million). Settlement is due to occur on February 13, 2004. The placing of the Sinopec shares was arranged by Morgan Stanley on behalf of BP. BP announced today that it intends to sell its entire 2.1 per cent equity stake in China Petroleum and Chemical Corporation (Sinopec). The company will carry out the sale through a bookbuilt placing of the shares on public markets. BP acquired the stake of approximately 1.8 billion 'H' shares in Sinopec when 20 per cent of the company was floated on international markets in October 2000. The 200 000 t/a ABS project with an investment of RMB1.56 billion in Sinopec Gaoqiao Petrochemical Company recently got approval from the State Development and Reform Commission, the concerned technology import contract was also nodded by the Ministry of Commerce. The project will kick off in Shanghai Chemical Industry Zone this October and complete by March 2006. Dow Chemical’s technology was selected as the production process. CALGARY, Alberta - PetroKazakhstan Inc. (the "Company") announced today that the acquisition of the Company for US$55.00 cash per share by CNPC International Ltd. ("CNPC") pursuant to a Court-approved Plan of Arrangement has closed. Shareholders will receive payment for their shares from Computershare Trust Company of Canada within the next few days. "We are delighted that the process which we started several months ago has been successfully concluded," said Mr. Bernard F. Isautier, Chairman, President and Chief Executive Officer of PetroKazakhstan. "CNPC has acquired a business full of opportunities and with high calibre employees. We wish them future success in Kazakhstan." As a result of the Arrangement, PetroKazakhstan is an indirect wholly-owned subsidiary of CNPC. PetroKazakhstan has applied to delist its shares from trading in the United States on the New York Stock Exchange, in Canada on The Toronto Stock Exchange, in the United Kingdom on the London Stock Exchange, in Germany on the Frankfurt Exchange and in Kazakhstan on the Kazakhstan Stock Exchange. October 25, 2005 PetroKazakhstan Inc.
CALGARY, Alberta - PetroKazakhstan Inc. (the "Company") is pleased to announce today that the Alberta Court of Queen's Bench has granted the order approving the Arrangement involving the acquisition of the Company for US$55.00 cash per share by a wholly-owned subsidiary of CNPC International Ltd. A copy of the Court's decision has been posted to the Company's website at www.petrokazakhstan.com. PetroKazakhstan intends to close the Arrangement tomorrow; October 26, 2005 as soon as possible after the order has been filed with the Court. PetroKazakhstan will make a further announcement once the closing has occurred. PetroKazakhstan shareholders approved on October an offer by CNPC (China National Petroleum Corporation) to buy the company at a price of US$55/share, representing the stage for the deal to be completed after solving some political uncertainty. Most of shareholders supported the deal with CNPC. PetroKazakhstan has frequently contacted with the former Soviet republic's government, but the officer declined to comment on them. In fact, Russian oil major Lukoil, a partner in a joint venture with PetroKazakhstan, has said it plans to ask the Alberta court to halt the deal because it believes it has rights to the venture stake that will be transferred to CNPC. CNPC, which is keen on acquiring oversea oil reserve, studied more from another Chinese petroleum company--CNOOC who failed in biding for Unocal due to ignoring political uncertainty. In recent weeks, the deal was nearly stopped because Kazakh lawmakers thought greater control over their country's oil reserves. The government of President Nursultan Nazarbayev passed a law last week that gives the state the right to involve in the sale of foreign-held oil stakes. On October 15 CNPC signed a memorandum with state-owned KazMunaiGaz to hand over part stakes to the latter. According to the memorandum, KazMunaiGaz will gain a US$1.4 billion stake in PetroKazakhstan. As an exchange, CNPC wins support for the deal that is nearly failed. Both of the two state-owned oil companies showed satisfaction to the agreement that can guarantee Kazakhstan government to secure control over some of PetroKazakhstan's assets. These include the Shymkent oil refinery, one of three oil processing plants based in the central Asian country. CNPC also showed a strong tension to supply sufficient oil products in Kazakhstan marketplace so that the oil safety in the country can be secured. China and Kazakhstan are building a 3 000 kilometer pipeline to pump crude oil to China across the Central Asian state, and the first-phase of the project is expected to be completed by the end of this year. All the oilfields and refineries of PetroKazakhstan located in Kazakhstan, with a crude oil production capacity exceeding 7 million tons per year. PetroKazakhstan Inc. (formerly Hurricane Hydrocarbons Ltd.) is a vertically, integrated, international energy company, celebrating its 8th year of operations in the Republic of Kazakhstan. It is engaged in the acquisition, exploration, development and production of oil and gas, refining of oil and the sale of oil and refined products. Click here to see a Map of Kazakhstan!Click on the image to see a Map of Kazakhstan. The company has been involved in joint ventures in Kazakhstan since 1991 and participated in the country's first major oil and gas privatization in November 1996. PetroKazakhstan purchased a state-owned oil production company, Yuzhneftegaz, now renamed PetroKazakhstan Kumkol Resources. In 2000, PetroKazakhstan purchased the downstream company Shymkentnefteorgsyntez (ShNOS), now renamed PetroKazakhstan Oil Products (PKOP), and became the largest private integrated oil company in Kazakhstan. As of January 1, 2005 PetroKazakhstan's proved and probable oil equivalent reserves were independently assessed at 550 million barrels. PetroKazakhstan's crude oil production is either refined in the Shymkent refinery and sold as refined products predominately in the Kazakhstani market or sold into the export market. Future exports continue to be investigated and pursued. 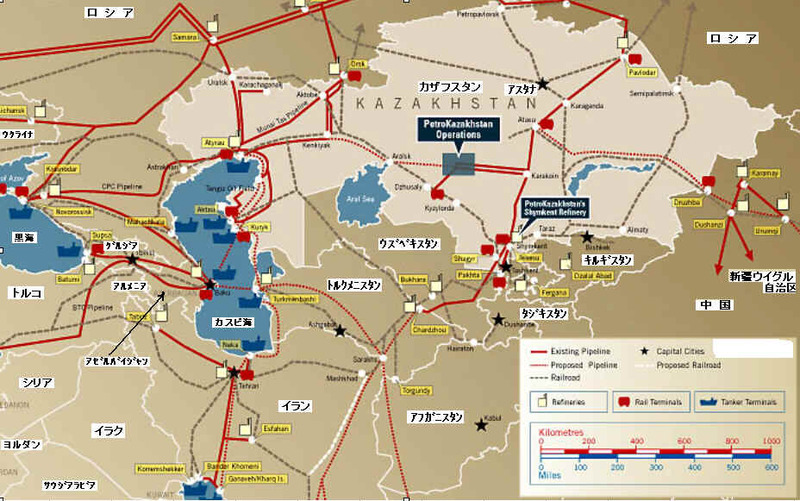 The KAM pipeline, a PetroKazakhstan 177 kilometre pipeline, began operating in June 2003. This pipeline enhances transportation options by eliminating 1,300 kilometes of circuitous movement and has led to transportation cost savings. PetroKazakhstan has built and fully commissioned a 55-megawatt gas power plant at its field operations which reduces gas emissions and improves the local environment. In its downstream operations PetroKazakhstan continues to enhance the product state of the refinery. The start up of the Vacuum Distillation Unit in January 2004 has led to a lower yield of heavy fuel oil. As technicians of Sinopec finished their last welding work in Alataw Pass Monday, the oil pipeline linking China and Kazakhstan joined ends after 18 months unremitting efforts. This marked a perfect accomplishment of the first period of the 1000-km oil pipeline project. The joining serves as a firm foundation for the eventual overall completion of this project soon. The first transnational oil project between China and Kazakhstan is jointly built by China National Petroleum Corporation (CNPC) and its Kazakh counterpart. In the first period of the project, 700 million US dollars was invested to build a 813-millimeter pipeline with an oil transfusion capacity of 20 million tons yearly. Along with the competitive bidding of Unocal by CNOOC Ltd., China's competent authorities were stepping up to obtain resources and experience in management, technology and brands from Australia. It was reported CNOOC possibly set Woodside, the Australian largest petroleum enterprise as the next target of requisition. Once the purchasing plan be put into force, the whole procedures for CNOOC's competitive bidding of Unocal would be made once again. The Government of Australia would also play an important role in it. 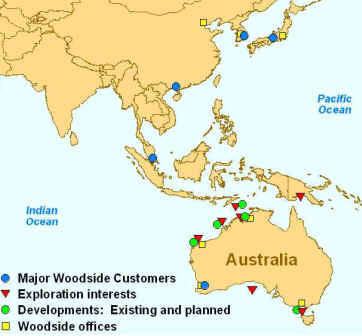 Woodside is Australia's largest publicly traded oil and gas exploration and production company with a market capitalisation of more than A$14 billion (at December 2004). Woodside operates the North West Shelf Venture, Australia's largest resource project. It also operates more than 75 joint ventures on behalf of 39 participants in Australia, Africa and the United States. The company sells liquefied natural gas, natural gas, crude oil, condensate and liquid petroleum gas around the world. With proved plus probable reserves of more than 1.3 billion barrels of oil equivalent, Woodside produces nearly 60 million barrels of oil equivalent a year. The company was formed in 1954 and has its headquarters in Perth, Western Australia. It has more than 2500 staff. The Yadavaran oilfield, one of the world's largest undeveloped oilfields, would have a total production capacity of around 300,000 barrels per day (bpd) and Iran would export half of this volume to China in the future based on the contracts to be signed by Sinopec and the National Iranian Oil Company. Yadavaran is a new name for both Koushk and Hosseiniyeh oil fields whose oil reserves were initially estimated at 9 bn and 1.5 bn barrels, respectively. Later it was discovered that various formations of the two fields were connected and they were renamed Yadavaran. The signing ceremony of cooperation agreement between Sinopec and Baoshan Iron & Steel Group was held in Beijing on Aug.11. Sinopec and Baoshan Iron & Steel Group both are extra large enterprises in key fields of national economy. And there is a rosy future for cooperation when both sides are to be further stronger and larger. Through establishing strategic cooperation relationship, the cooperation in technology, business and information with the principle of “equity and trust, sharing risks, pooling of interest, benefiting mutually and collaborative development” will step into a new stage. The two groups have been maintaining a good relationship of cooperation for a long time. In the new situation of the ever-expanding internationalization of economy and the more and more fierce market competition, large enterprises could confront challenges jointly, establish market and benefit mutually through establishing stable relationship of strategic cooperation between them. In December 2003 Nelson Resources Ltd. purchased 35% interest belonging to Nimir Petroleum Buzachi BV from CNPC. Later in February 2004, Nelson purchased an additional 15% belonging to Texaco North Buzachi Inc, bringing its share of the North Buzachi Field to 50%. Following the acquisition of 50% of the North Buzachi field by Nelson Resources, Nelson Resources and CNPC have formed a joint operation company to operate the field (Buzachi Operating Limited). Buzachi Operating Limited, has a core national workforce inherited from ChevronTexaco and is managed equally by Nelson Resources and CNPC employees seconded to the joint venture. It is therefore well staffed to fast track the development of the field. Nelson Resources Limited (TSX:NLG) is a leading independent exploration and development company operating in Kazakhstan. Nelson Resources Limited (“Nelson”) of Bermuda (TSX/AIM: NLG) previously announced that it had entered into a definitive agreement with LUKOIL Overseas Holding Ltd. (“Lukoil”) dated October 13, 2005 to effect an amalgamation between Nelson and a wholly-owned subsidiary of Lukoil. On the effective date of this amalgamation, all issued and outstanding common shares of Nelson on a fully diluted basis will be exchanged for US$2 billion in cash, resulting in a payment to shareholders of approximately US$2.1916 per fully diluted share. Nelson Resources Limited (“Nelson”) of Bermuda, a leading oil exploration and production company operating in Kazakhstan, announces that it has been informed by China National Petroleum Corporation (“CNPC”), the Company’s joint venture partner on the North Buzachi oil field, that CNPC intends to take the necessary measures to exercise its pre-emptive right under the North Buzachi Joint Operating Agreement to acquire the Company’s 50% interest in the North Buzachi field, following the purchase by Lukoil Overseas Holding Ltd. (“Lukoil”) of a 65% controlling interest in the Company. Nelson takes the position that no such pre-emptive right exists in the current circumstances. Recently, China government has approved two large-scale ethylene projects, the one is PetroChina’s Chengdu project, and another is a Sinopec’s Tianjin project. The total investment is about USD2.47 billion (RMB 20 billion), it includes an 800,000-t/a cracker and downstream units, while the details of downstream units are not disclosed. The project is expected to starts-up by 2008. The naphtha feedstock for the Chengdu ethylene project will be transported by railway from PetroChina's refineries in Gansu province and Shaanxi Province. The completed pipeline will be used for gasoline and diesel oil. At the same time, Sinopec Tianjin Petrochemical Co has got the final nod from the Chinese government for its 1 million-t/a ethylene cracker project in Dagang district, Tianjin City. The Tianjin project is wholly owned by Sinopec, it will cost USD 2.48 billion (Rmb20.1), and the project is also expected to come on stream in 2008. Naphtha feedstock would be sourced from the nearby refinery; Sinopec also has a plan to expand the existing refinery capacity to 12.5 million-t/a in Tianjin. Currently, the details of downstream units cannot be confirmed. Tianjing United Chemical Co. has changed its name to Sinopec Tianjing Pertrochemical Co, it is the operator of this new project. Sinopec Tianjin Petrochemical has an existing 5 million tonne refinery and 200,000 tonne ethylene plant. The refinery will be expanded by 7.5 million to 12.5 million-t/a; the 1 million-t/a ethylene project is new added. The country's biggest oil refiner Sinopec got the government's go-ahead to build a US$3.1-billion petrochemical complex in North China's port city of Tianjin. "We received the approval from the State Council on December 21," an official responsible for Sinopec's corporate planning said yesterday, declining to be named. The Tianjin project, to be completed by 2008, includes a 1 million ton per year ethylene cracker, a refinery able to process 12.5 million tons of crude oil a year, and other facilities to produce petrochemical products such as polyethylene and polypropylene. Total investment of the project is expected to exceed 25 billion yuan (US$3.1 billion), which will be wholly owned by Sinopec, said an unnamed official from the Tianjin Municipal Development and Reform Commission. To cash in on the market, Sinopec's domestic rival PetroChina is also talking with Tianjing city to build a similar-sized petrochemical complex including refining and ethylene production facilities near Sinopec's plant, said Zhang from the Tianjin Development and Reform Commission. China Petroleum and Chemical Corp on Monday held a foundation laying ceremony in northern Tianjin municipality to mark the launch of a Yuan 25 billion ($3.13 billion) refinery and ethylene production expansion program by its subsidiary Sinopec Tianjin Company, the New York- and Hong Kong-listed Chinese integrated oil group said on its website Tuesday. Key refining development projects under the program include building a 10 million mt/year (200,000 b/d) crude topper with vacuum distillation unit, 2.3 million mt/year delayed coker, 1.8 million mt/year hydrocracker, 3.2 million mt/year gasoil hydrofining unit, 1.2 million mt/year hydrotreating unit for waxy oil, 260,000 mt/year sulfur recovery unit, among others. STC currently operates two sets of crude toppers with vacuum distillation units of 2.5 million mt/year each, 1.2 million mt/year catalytic cracker, 800,000 mt/year hydrocracker, 400,000 mt/year hydrofining unit, and 150,000 mt/year desulfurizer. Plans for petrochemical capacity expansion include building a 1 million mt/year ethylene plant, which will eventually raise STC's annual ethylene production capacity from the existing 200,000 mt to 1.2 million mt. The group also plans to build a 600,000 mt/year gasoline hydrocracker, a 300,000 mt/year low-density polyethylene unit, a 300,000 mt/year high-density polyethylene unit, a 450,000 mt/year polypropylene unit and other downstream petrochemical production plants. SINOPEC Tianjin Company is a state-owned super-large complex of oil refining, ethylene, chemical and chemical fiber production. It is located at Beiweidi Road (West) No.160, Dagang District of Tianjin. Encompassing 13.24 KM2 land area, it is west to Bohai Bay and north to Dagang Oilfield. It possesses superior geographical position which is convenient for sea and land transportation, linked by railways and highways to the urban city and Tianjin Port as well as oil-conveying pipelines to Dagang Oilfield and Nanjiang Petrochemical Quay in Tianjin Port. It has 13 oil refining units, 8 chemical production units and 5 chemical fiber units. The processing capacity of crude oil has achieved 5 million MT/Y, ethylene 200,000MT/Y, PX 380,000MT/Y, PTA 300,000MT/Y, polyester 270,000MT/Y, polyester fiber 160,000MT/Y and polyester filament 90,000MT/Y. Crude oil stock may reach up to 800,000M3. The company possesses its own dock in Tianjin Port with berths of 150,000 tons, 50,000 tons, 30,000 tons and 15,000 tons. The annual crude oil handling capability amounts to 18 million tons. Main products of the company include over 70 varieties covering the products of more than 200 specifications, such as clean automobile gasoline, kerosene, jet fuel, diesel, LPG, heavy fuel oil, asphalt, petrol coke, para-xylene, purified terephthalic acid, petrobenzene, ethylene, polyethylene, polypropylene, ethylene oxide, ethylene glycol, polyether, polyester chips, polyester filament and polyester fiber, etc.. The company has established a very good reputation in the market. Sinopec Tianjin Petrochemical Corporation is located in Dagang District of Tianjin New Coastal Area, situated on the Bohai coast with a beautiful environment, holding the key position between Beijing, Hebei and Shandong, possessing convenient transportation system including road, railway, waterway and air. In the north of the plant area, there is Tianjin South Ring railway which links two rail arterys of Jing-Shan and Jin-Pu; In the East, there are Xian-Qi and Gang-Tang roads; in the west, there is Jin-Zi road, and the Jin-Gang road is in the north. It is only about 40 kilometers away from Tianjin Airport. Chemical section: It has Aromatics Complex with capacity of 600, 000 t/y reformer and 250,000 t/y PX, PTA plant with capacity of 300, 000 t/y and Polyether Polylol plant with capacity of 43, 000 t/y. Chemical Fibre Section: It has Polyester Plant with capacity of 200, 000 t/y; PET Staple Fibre Plant with capacity of 100,000 t/y; PET Filament Plant with capacity of 90,000t/y FDY and POY; Film-grade Chips Plant with capacity of 80,000 t/y and Pilot Plant with capacity of 2000 t/y differential staple fibre. Ethylene section: It has Ethylene Plant with capacity of 200,000 t/y; Polyethylene Plant with capacity of 120,000 t/y; Polypropylene Plant with capacity of 60, 000 t/y; EO Plant with capacity of 22, 000 t/y and EG Plant with capacity of 48, 000 t/y. 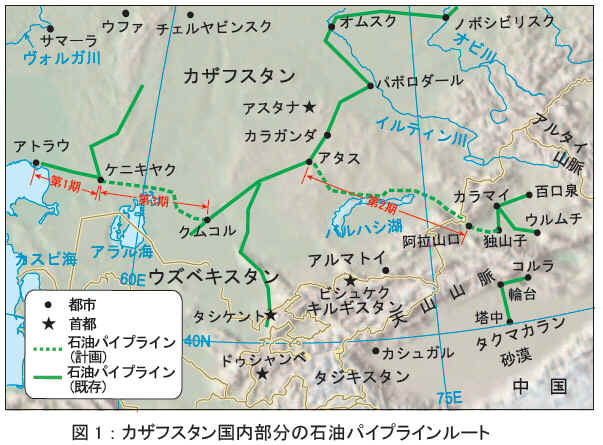 PetroChina Co. Ltd. expects to complete a 1,247-km oil products pipeline by June 2002. The line starts from Lanzhou, the capital of northwestern China's Gansu province, and will end in Chongqing city via Chengdu, the capital of Sichuan province in southwest. 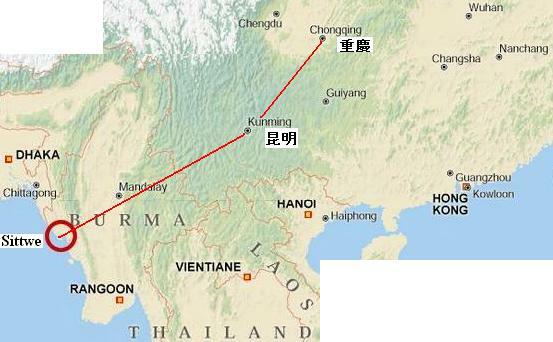 The Sichuan section of the pipeline (from Chengdu to Chongqing) began construction in July last year. Work on the remaining portion will start this year. The line will move oil products produced by PetroChina's Lanzhou Petrochemical Corp. to markets in Yunnan, Guizhou, and Sichuan provinces and Chongqing City. Demand in those areas reached 7.8 million tonnes at end 2000, but only 200,000 tonnes of oil products were produced in the region. Chinese state-owned giant Sinopec Friday began trial runs at its 8 million mt/year (160,000 b/d) greenfield refinery and petrochemical complex in China's southern island province of Hainan. The complex has 15 refining and petrochemical units including an 8 million mt/year crude distillation unit, 2.5 million mt/year vacuum distillion unit, 2.8 million mt/year heavy oil catalytic cracker, 1.2 million mt/year continuous reformer, 2 million mt/year gasoil hydrogenation unit, 300,000 mt/year jet fuel hydrogenation unit, 60,000 mt/year gas fractionation unit, as well as facilities producing isomers, polypropylene, and MTBE. On November 15th, 2006 the 80 000 t/a ethyl benzene/styrene monomer unit put on stream in Hainan Shihua Garson Chemical Co., Ltd. in Hainan province. Hainan Shihua Garson Chemical Co., Ltd. is jointly funded by Hainan Shihua Refining and Chemical Co., Ltd. and Jiangsu Garson Chemical Industrial Co., Ltd. It is released that the unit is the first extension project for the chemical industrial chain of Sinopec Hainan Refining & Chemical Co., Ltd. (HRCC). After completion, the industrial chain will be extended further to downstream operations and a capacity of 100 000 t/a polystyrene will be developed. China Petrochemical Corporation (Sinopec Group), the biggest crude oil processing giant in China, announces that its ethylene productive capacity has reached 6.295 million tons in 2008 and will possibly hit 10.7 million tons by 2012. Sinopec Group has seen a fast growth in its ethylene capacity in the past decade. It just could produce 2.575 million tons in 1998, compared with 3.772 million tons of the national capacity, which just reaches 10 million tons or so this year. Notably, 70% of ethylene production devices owned by Sinopec Group are China-made. The group can use self-developed technologies to build 1-million-ton-class ethylene production device. The group has set up three petrochemical industrial base clusters in the Yangtze River Delta, the Pearl River Delta and the Ring Area of Bohai Sea. Three 1-million-ton bases and two 800,000-ton bases are there. Moreover, three new bases are under construction now. Estimates say that China will demand 25 million tons of ethylene by 2010 while the real productive capacity of the country will just hit 14.5 million tons. CNOOC Ltd. will form a 50%/50% joint venture with Bridas Energy Holdings Ltd in Bridas Corporation. CNOOC and BEH will jointly make management decisions for Bridas. Bridas is a holding company with a 40% interest in Pan American Energy, the second largest Argentine E&P company that is jointly owned by Bridas and BP. In China’s ongoing quest for energy assets, Sinopec, one of the world’s largest oil companies, plans to invest $7.1 billion to buy into oil-rich Brazil via an alliance with Spain’s Repsol. The deal would create one of Latin-America’s largest private energy companies, valued at $17.8 billion. Together, Sinopec and Repsol will develop the projects of Repsol Brasil, the upstream subsidiary of Repsol in Brazil whose assets, including those in the Guara and Carioca pre-salt basins, are currently valued at US$10.67 billion. Repsol, currently the largest foreign owner of exploratory blocks in Brazil, will retain 60% of the resulting company and Sinopec, China’s second largest oil company, will have a 40% stake. Brazil’s offshore boasts one of the world’s fastest-growing oil and gas reserves. Sinopec is targeting production of 200,000 barrels per day oil equivalent from the mostly offshore blocks. Guara is estimated to hold 1.1 billion to 2 billion barrels of recoverable oil, and, while no production estimates have been reported, Carioca is also considered a promising field. For Repsol, the deal means access to capital needed to fund its offshore projects near Rio de Janiero and Sao Paulo. “We are very pleased to share the development of Repsol’s Brazilian projects with an internationally renowned and experienced partner as is Sinopec.” said Repsol Chairman Antonio Brufau. The deal, subject to approval, marks China’s largest international oil and gas investment in 2010. Last year, Sinopec paid $7.5 billion to acquire oil and gas explorer Addax Petroleum to gain access to reserves in Iraq and offshore West Africa. According to Sinopec, the company is developing almost 50 projects in 20 countries. Repsol Brasil will carry out a capital increase worth more than $7.1 billion, which Sinopec will subscribe in its entirety, resulting in a company valued at $17.8 billion. The company will be one of Latin-America’s largest privately-owned energy companies. Repsol will retain 60% of the resulting company and Sinopec, China’s second largest oil company, will have a 40% stake. With this new investment, Repsol Brasil is fully capitalized to develop all of its current projects in Brazil, including world class discoveries in the Guara and Carioca pre-salt basins. Repsol and Sinopec will continue their respective expansion plans in Brazil and will participate, jointly or individually, in future bidding rounds in the area. This transaction between two world class groups bears testimony to the value of the exploratory activity carried out by Repsol in Brazil in the last few years. “We are very pleased to share the development of Repsol’s Brazilian projects with an internationally renowned and experienced partner as is Sinopec. Together we can help expand business relations between our countries,” said Repsol Chairman Antonio Brufau. Sinopec is the largest petroleum and petrochemicals company in China and has oil and gas exploration and production projects in more than 20 countries. Repsol and China’s Sinopec have entered into an agreement to jointly develop the projects of Repsol Brasil, the upstream subsidiary of Repsol in Brazil, creating one of Latin America’s largest energy companies, valued at $17.773 billion. Repsol Brasil’s assets are currently valued at US$10.664 billion. Under the terms of the agreement, Repsol Brasil will increase its share capital by issuing new shares to which Sinopec will fully subscribe. On completion of the transaction, Repsol will hold 60% of the shares of Repsol Brasil while Sinopec will hold 40% of the shares. The injection of funds generated by this transaction will allow Repsol Brasil to fully develop all of its current projects, which include some of the world’s largest exploratory discoveries in recent years. The agreement between Repsol and Sinopec involves full collaboration in the development of the existing projects in Brazil, and allows for both companies to continue expanding their activity in that country jointly or independently. The agreement is subject to the approval of the competent authorities. “We are very pleased to share the development of Repsol’s Brazilian subsidiary with an internationally renowned and experienced partner as is Sinopec. Together we can help expand business relations between our countries,” Brufau added. Brazil’s offshore boasts one of the world’s fastest-growing oil and gas reserves. The deal highlights the enormous international interest in this historic moment for Brazil, and particularly for the Santos Basin pre-salt activity led by Petrobras. Repsol is one of the largest independent upstream operators in Brazil and the country’s third-largest oil producer in 2009. 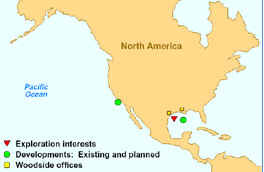 It is the largest foreign owner of exploratory blocks, with presence in the Santos, Campos and Espiritu Santo Basins. Repsol has a strategic presence in Brazil’s pre-salt areas with the most potential, and together with Petrobras and BG Group is leading exploration in the prolific Santos basin. The company’s diversified projects portfolio includes a producing field (Albacora Leste) and eight discoveries as well as other exploratory projects and identified areas of potential. Occidental Petroleum Corporation today announced it has executed an agreement with a subsidiary of China Petrochemical Corporation (Sinopec) to sell Occidental’s Argentine oil and gas operations for after-tax proceeds of approximately $2.5 billion. Occidental also announced that it had executed agreements to purchase oil and gas properties in South Texas and North Dakota for about $3.2 billion. Additionally, Occidental announced that it has signed an agreement to increase its General Partner (GP) ownership in Plains All-American to approximately 35 percent; and it has agreed to acquire the remaining 50 percent joint venture interest in the Elk Hills Power Plant. Occidental expects all of these transactions to be completed no later than the end of the first quarter of 2011, subject to normal regulatory approvals. "These transactions will be immediately accretive to our earnings, return on capital employed and cash flow after capital. With these new acquisitions and without Argentina in our asset mix, achieving both our short-term and long-term average annual production growth outlook of 5-8 percent will be more certain and will generate higher returns,” said Dr. Ray R. Irani, Chairman and Chief Executive Officer of Occidental Petroleum Corporation. “In light of our outlook for improved free cash flow, the Board has agreed to increase our common dividend rate by 21 percent from 38 cents per quarter to 46 cents per quarter effective with the April 15th payment. The formal dividend declaration will be made by the Board of Directors in February," said Dr. Irani. The South Texas assets will be purchased from Shell for about $1.8 billion and currently produce approximately 200 million cubic feet per day of gas equivalent. Shell has owned and operated the properties for many years. The assets will be 100 percent operated by Occidental and have an excellent inventory of drilling opportunities. Occidental is purchasing, from a private seller, approximately 180,000 net contiguous acres in North Dakota which produce from the Bakken formation and are prospective in the Three Forks formation. The purchase price is approximately $1.4 billion. The assets currently produce approximately 5,500 BOEPD and Occidental’s net risked reserve exposure is in excess of 250 million barrels of oil equivalent. Combined with Occidental’s other interests in the Williston Basin, Occidental will have an interest in over 200,000 net acres and over 6,000 BOEPD of production. Occidental expects to grow production in the Williston Basin to at least 30,000 BOEPD over the next five years. Occidental is purchasing an incremental 13 percent ownership in PAA’s general partner, bringing its total ownership in the GP to approximately 35 percent. PAA’s operations compliment Occidental’s domestic oil and gas operations. Plains is one of the largest operators of oil pipelines in North America with operations in Texas, California, and North Dakota, among other areas. In addition, Occidental is purchasing Sempra Generation’s 50 percent interest in the Elk Hills Power Plant, bringing Oxy’s ownership to 100 percent. This will improve efficiency and lower operating costs at Oxy’s Elk Hills business unit. Occidental’s Argentine assets being divested currently produce approximately 44,000 BOEPD net to Oxy. When the transaction closes, Occidental expects to report a gain on the sale. The company will finance the acquisitions from both existing balance sheet cash and debt financing. Oxy plans to sell its Argentina assets, which include current production of 44,000 barrels of oil equivalent production per day and 130 million boe of proved reserves to a subsidiary of China Petrochemical Corporation (Sinopec) for aftertax proceeds of about $2.5 billion. Given government regulations that limit profits from oil production and discourage investment, Oxy's opportunities in the country probably did not match returns of its other international or U.S.-based projects. Based on our estimates, we believe Oxy generated an attractive valuation for its assets. We estimate Sinopec paid Oxy about $19 per boe and $57,000 per flowing barrel compared with the $8 and $52,000, respectively, that CNOOC recently paid for BP's BP 60% stake in Argentine oil and gas company Pan American Energy. Occidental is exiting Argentina amid price controls on gas that make it harder to earn profits in Latin America’s second- largest economy, Weiss said. Occidental acquired the Argentine fields when it bought Vintage, along with assets from the Gulf of Mexico to Yemen. The company got 49 percent of its net daily oil production and 58 percent of its gas from the U.S. during the first half of this year, according to company data. Argentina contributed about 5 percent of worldwide output. The Occidental Petroleum Corporation, the oil producer, agreed On Oct.13, 2005, to acquire its smaller rival, Vintage Petroleum, for about $3.52 billion, as it seeks to expand in Latin America and California. It’s the first investment in Argentina’s oil and gas industry for the Chinese refiner, known as Sinopec Group. The fields produced more than 51,000 barrels of oil equivalent a day last year and held 393 million barrels of proven plus probable reserves as of the end of 2009, according to Sinopec. After the completion of this project, with a total investment estimated to surpass CNY 100 billion, Sinopec Group will be China's first oil refining company with an annual capacity of over 30 million tons, which is expected to rank in the top five companies among the global oil refining enterprises. The project will be divided into two phases: The first phase includes the oil refining project with an annual capacity of 12 million tons and the PX project with an annual capacity of 1 million tons. The second phase includes the oil refining project with an annual capacity of 20 million tons and the ethylene project with an annual capacity of 1 million. "Jiangsu is an advantageous region for Sinopec Group since it has its own harbor and sufficient land, which could facilitate the construction of integrated projects for oil refinery." A managerial person working for Lianyungang local government told National Business Daily. The State Council has approved a scheme to set up a demonstration zone in Lianyungang city in Jiangsu Province to enhance economic cooperation among the country's east, central and western regions, China's top economic planning body said on Thursday. Daylight Energy Ltd. is pleased to announce that it has entered into an agreement with Sinopec International Petroleum Exploration and Production Corporation ("SIPC") for the purchase of all of the issued and outstanding common shares of the Corporation at a cash price of C$10.08 per Common Share, for total cash consideration of approximately C$2.2 billion. The transaction is to be completed by way of a plan of arrangement under the Business Corporations Act (Alberta). The consideration offered for the Common Shares pursuant to the Arrangement represents a 43.6% premium over the 60-day weighted average trading price of the Common Shares on the Toronto Stock Exchange up to and including October 7, 2011. SIPC is a wholly owned subsidiary of China Petrochemical Corporation ("Sinopec Group") and undertakes overseas investments and operations in the upstream oil and gas sector. Sinopec Group is China's largest producer and supplier of oil products and major petrochemical products. The Board of Directors and officers of Daylight intend to vote their respective Common Shares, totaling approximately 6.7 million Common Shares, in favour of the Arrangement, and have entered into lock-up agreements with SIPC pursuant to which they have agreed to, among other things, vote their Common Shares in favour of the Arrangement. Daylight is a growing intermediate oil and liquids rich natural gas producing company with a high quality suite of resource play assets in Western Canada. Daylight has approximately 213 million Common Shares currently outstanding which trade on the TSX under the symbol “DAY”. Daylight's Series C and Series D Debentures also trade on the TSX under the symbols DAY.DB.C and DAY.DB.D, respectively. China's Sinopec Group, parent of top Asia refiner Sinopec Corp , said it had completed the acquisition of Canadian oil and gas explorer Daylight Energy Ltd for C$2.2 billion ($2.16 billion). Its subsidiary Sinopec International Petroleum Exploration and Production Corp (SIPC) will get Daylight's assets in 69 oil and gas fields in northwest Alberta and northeast British Columbia via the deal, Sinopec said in a statement late Friday. "Sinopec will fully utilise the advantage of Daylight's existing management, technology and human resources to further expand and develop its oil and gas business in Canada," the state-owned company said. In October, SIPC agreed to buy all outstanding shares of Calgary, Alberta-based Daylight for C$10.08 each, more than double the closing price of C$4.59 per share prior to the announcement. Shares of Daylight, which was listed in Toronto in 2004, closed at C$10.07 on Friday. Sinopec will infuse $4.8 billion into Galp Energia’s Brazilian subsidiary, Petrogal Brasil and other related operational subsidiaries, receiving 30% ownership, with Galp Energia retaining 70% ownership. In addition, Sinopec will make a shareholder loan to Petrogal Brasil in the estimated amount of $390 million, which will be used to reimburse 30% of the loans to Galp Energia of $1.3 billion. Asia's top refiner said in a statement the transaction was subject to approval from the Chinese government. Galp Energia SGPS SA, a major oil and gas producer in Portugal, operates four offshore blocks in the Santos Basin off Brazil, state-owned Sinopec said. SACOR, CIDLA, SONAP, PETROSUL, and PETROGAL were the main Portuguese companies from where current-day GALP was born. In Portugal, PETROGAL was formed in April 1976 from four Portuguese companies —SACOR, CIDLA, SONAP, and PETROSUL — that were nationalized following the revolution of April 1974. Galp Energia's initial public offering on the Lisbon Stock Exchange took place in 2006. "The acquisition has further expanded Sinopec's overseas oil and gas business operations and will make major contributions to the company's oil and gas output growth," Sinopec said in a statement. The total cash payout will eventually reach about $5.18 billion, including the value of the 30 percent stake and projected future capital expenditure, Sinopec said. Shanghai-listed shares in Sinopec closed up 1.2 percent to 7.5 yuan on Friday while its Hong Kong shares were up 3.11 percent at HK$8.25. Galp Energia, which has projects around the world including Brazil, Venezuela, Uruguay, Angola, Mozambique, Swaziland and Gambia, could not be immediately reached for comment. China's quest for resources is increasingly taking it to South America, as it seeks to shore up access to oil, gas, coal and iron ore needed to fuel the world's second-largest economy and biggest energy consumer. Last December, Sinopec said it would buy the Argentinean arm of US Occidental Petroleum Corporation for $2.45 billion, marking its first investment in Argentina's upstream oil and gas sector. Norwegian energy group Statoil also agreed last year to sell 40 percent of the Peregrino oil field off Brazil to China's Sinochem for nearly $3.1 billion. That followed a move by state-owned China National Petroleum Corp to pay $900 million for access to oil deposits in Venezuela's eastern Orinoco region. Chinese trade with resource-rich Latin America has grown about ten-fold over the past decade as Beijing's search for new sources of raw materials has expanded, while South American purchases of Chinese goods have also climbed. China's trade with the region reached $183.6 billion in 2010, compared with $121.9 billion in 2009, the latest official figures show. Chinese investment in Latin America reached $10.5 billion in 2010, up from $7.3 billion in 2009. PetroChina and Sinopec were rumored to have called for the raising of the threshold for the windfall tax on domestic oil and gas production to $70 per barrel, reports Securities Daily. In addition, the two energy giants had suggested the cancellation of other special levies, such as the emissions tax, on the oil and gas sector, and that such charges be imposed as part of the resources tax. According to guidelines imposed in 2006, oil producers have to pay the special taxes once the oil price hits $40 per barrel. Taxes collected from the oil companies are used to subsidize downstream industries and the general public hurt by high oil prices, according to the report. The three biggest oil companies in China paid 88.43 billion yuan of windfall taxes in 2010 as the international price of oil rose. In the first half of 2011, the amount of windfall taxes paid by PetroChina increased 25.23 billion yuan year-on-year, while the sum paid by Sinopec rose 8.8 billion yuan. The three oil giants paid a record high of 87 billion yuan of windfall taxes in the first half of 2011. The National Development and Reform Commission had announced in October that it will expand the scope of the resources tax to the entire country, effective November 1. The tax rates on crude oil and natural gas will be 5-10 percent of the sales value. Shares of PetroChina fell 1.01 percent to close at 9.81 yuan today. This consists of Resource Tax and Urban and Township Land Use Tax. These taxes are applicable to the exploiters engaged in natural resource exploitation or to the users of urban and township land. These taxes reflect the chargeable use of state-owned natural resources, and aim to adjust the different profits derived by taxpayers who have access to different availability of natural resources. The Saudi Basic Industries Corporation (SABIC) and the China Petroleum and Chemical Corporation (Sinopec) have signed a protocol of cooperation in Riyadh to explore new business opportunities. It also confirms their commitment to the principles reached in earlier agreements, including the deal on polycarbonate collaboration, according to a SABIC statement received here. Prince Saud bin Abdullah bin Thenayan Al-Saud, chairman of SABIC and the Royal Commission for Jubail and Yanbu, and Fu Chengyu, chairman of the Sinopec Group and the Sinopec Corporation, signed the deal. China Prime Minister Wen Jiabao and SABIC Vice Chairman and CEO Mohamed Al-Mady were also present at the signing ceremony. The protocol sets the foundation for a joint investment from both SABIC and Sinopec to build the new polycarbonate production complex with an annual capacity of 260 kilo metric tons. The new facility will be located at the Sinopec SABIC Tianjin Petrochemical Company (SSTPC) in Tianjin, China. Polycarbonate is an essential material used for producing components for a vast array of consumer, industrial and commercial products ranging from automotive parts, household wares to medical supplies. The new polycarbonate production will help meet the projected growth in demand for North East Asia, which includes China. Satisfying this demand is essential for producing petrochemical materials from China’s vast manufacturing industries. Prince Saud emphasized that SABIC is keen to continue its investments in China’s marketplace generally and one significant aspect of the new project is that it will use SABIC-owned polycarbonate production technology. The technology mitigates the environmental footprint in the polycarbonate production process. When the plant is fully operational in 2015, SABIC will become one of the world’s largest producers of polycarbonate, significantly boosting SABIC’s market share. The protocol of cooperation, which covers marketing, allows SABIC to supply polycarbonate as feedstock to the company’s other plants in China and the Pacific region. Prince Saud said SABIC is a keen observer of the high growth rates achieved by China. Prince Saud said the new project, along with the first joint venture with Sinopec, with an annual production capacity of three million tons, will strengthen SABIC’s competitiveness. It could even lay the groundwork for further joint ventures between the two companies, offering more opportunities for two-way exchange of technologies and sharing of markets. Long-term strategic partnerships will boost the economies of the two countries in the areas of scientific research, technological innovation, engineering, project implementation, product marketing and procurement, he said. Al-Mady said the protocol will strategically strengthen both SABIC and Sinopec as two pioneering companies in polycarbonate production and applications in China. SABIC brings to China its global expertise and experience in petrochemical research and production. The partnership complements SABIC’s already strong engineered plastics manufacturing presence in compounded resin blends. Sinopec Group, Asia's largest oil refiner, announced Monday it has reached an agreement through its subsidiary with Canadian company Talisman Energy Inc to acquire a 49 percent equity interest in Talisman's assets in the North Sea for $1.5 billion. The transaction between Petroleum Exploration and Production Corporation, Sinopec's subsidiary, and Talisman Energy (UK) Limited is expected to be concluded by the end of this year, subject to regulatory approval from the Chinese and British governments. The deal structure will be a corporate joint venture that plans to invest to improve operating performance, as well as infill drilling, exploration opportunities and major projects, thereby extending field life and deferring decommissioning. Sinopec will appoint personnel into key positions within the joint venture while TEUK will operate the assets. No reduction in TEUK staff numbers is expected. Sinopec has sped up its overseas merger and acquisitions in recent years to boost its oil and gas reserves. Based in Aberdeen, Scotland, TEUK employs 564 full-time employees, with about 1,950 core contractors. Talisman Energy has a diversified, global portfolio of oil and gas assets. Talisman’s main operating areas are North America, the North Sea and Southeast Asia. In addition, the company is pursuing a number of high-impact international exploration opportunities. In 2010, Talisman produced 417,000 boe/d, approximately 50% oil and 50% natural gas. Hubei Chemical Fertilizer Branch Co. of Sinopec disclosed on September 3 that it officially started construction of industrial demonstration equipment making ethylene glycol from synthesis gas. With a total investment of over CNY 2 billion, the project will be completed and put into operation in 2013 and it will produce 200,000 tons of ethylene glycol annually. China needs 40 million tons of fibre every year, of which 60% is chemical fiber. Raw material of chemical fiber is ethylene glycol. Currently China produces ethylene glycol mainly with oil. Making ethylene glycol by non-oil way is a leading technology in China and can efficiently reduce China's dependence on import of oil. On January 11th 2012, Mr. Wang Tianpu, the president of SINOPEC Group visited Sinopec Hubei Fertilizer Company, to investigate the operation of the branch’s coal gasification unit and preparations for the first SINOPEC syngas-to-MEG (mono-ethylene glycol) demonstration project. As reported, this novel MEG process demonstration has been listed in SINOPEC R&D program and SINOPEC Shanghai Engineering Company (SSEC) was awarded with the general engineering contract for the project. SSEC is requested to accomplish basic engineering in May 2012 and detailed engineering by February 2013, and mechanical completion is scheduled in June 2013, followed by commissioning and start-up in September 2013. SINOPEC syngas-to-MEG process has entered the experimental stage. A 1000t/a pilot was built in Yangtze Petrochemical (Sinopec YPC) and accomplished catalyst & reaction process research in oxalate synthesis and oxalate hydrogenation, obtained MEG products with polyester grade quality. SSEC has prepared a 200kt/a syngas-to-MEG process design package. SINOPEC Hubei Fertilizer Company is located in Zhijiang City of Hubei Province. The branch is equipped with two syngas systems based on gas and coal feed respectively (the coal gasification unit uses a 2000t/d Shell gasifier with 142,000Nm3/h raw syngas capacity. The gas systems can supply syngas for 900kt/a ammonia synthesis and the downstream units are capable to produce 396kt/a ammonia plus 600kt/a urea. According to the coal chemical developing strategy of SINOPEC in 12th-5 Year period (2011-2015), Hubei Fertilizer is carrying out restructuring of product portfolio, including execution of this 200kt/a MEG project. Sinopec Engineering Group said it has entered into a deal to build a $3.1 billion plant in northern China to turn coal into petrochemicals, as China seeks to reduce its reliance on petrochemical imports. Sinopec Engineering will be responsible for engineering, procurement and construction of the 18.67 billion-yuan project in Inner Mongolia, which it said would be the largest of its kind in the world. The plant will produce 3.6 million tonnes a year of olefins - mostly ethyelene which is a building block for petrochemicals that are widely used in construction, textiles and automobiles. China, the world's biggest net importer of oil, is a leading buyer of petrochemicals, and imports about 45 percent of its ethylene. Sinopec Engineering, a newly listed unit of state-run Sinopec Group, said it would deploy a self-developed technology to make olefins from methanol, which can be extracted from coal. The coal-based process is cost competitive versus China's conventional way of making petrochemicals from more costly naphtha, a refinery product processed from crude oil. "Sinopec has long realized that it needs to diversify feedstocks for making ethylene," said Yan Kefeng, an analyst with consultancy IHS CERA. The plant, at Uxin county of Inner Mongolia's Ordos city, is owned by Zhong Tian He Chuang Co. Ltd 中天合創能源(中天相乗エナジー), a joint venture which has Sinopec Corp and China Coal Energy Company 中国中煤能源 among its main investors. "It is a significant milestone for SEG to establish an integrated new coal chemical industrial chain," the company said in a statement released late on Tuesday. INEOS Technologies is pleased to announce that it has licensed its Innovene PP process to Zhong Tian He Chuang Energy Company Limited. Located in Ordos City, Inner Mongolia Autonomous Region, the 350kta plant will manufacture a full line of polypropylene resins, including homopolymers, random copolymers, and impact copolymers,.and will serve the rapidly growing Chinese PP markets. Zhong Tian He Chuang is a joint venture between China’s largest petrochemical company-Sinopec, and China’s largest coal company-China Coal Energy Group Co.,Ltd. The final selection of Innovene PP in their Methanol -To- Olefin complex demonstrates a growing appreciation for Innovene PP in the Chinese coal industry. Ordos is located approx. 700km West of Beijing. China's Ministry of Land Resources (MLR) fined Sinopec Corp for failing to fulfil spending pledges on a shale gas block, in what a government source said is a move to toughen supervision of oil and gas exploration concessions. China, believed to hold the world's largest technically recoverable shale gas resources, aims to replicate the boom that swung the United States from building liquefied natural gas (LNG) import terminals to building LNG export facilities. But a lack of rapid development has frustrated Beijing. Four years of work have so far yielded only one large find - Fuling field - in the most prospective gas province of southwest Sichuan. Experts say the Fuling success is hard to repeat due to complex geology and high costs. MLR, in charge of mining rights and also the main agency behind the shale gas push, fined Sinopec about 8 million yuan ($1.3 million) for missing the spending pledge for a block awarded in 2011 in China's first shale gas tender, the ministry said in a statement on Monday. "It's an early example that MLR wants to toughen the supervision of oil and gas blocks, to convey the message that if a company does not spend enough on prospecting resources it had better return them so others can work on them," the government source involved in shale gas planning said on Wednesday. The official, who declined to be named as he's not authorized to speak to the press, said MLR will apply similar scrutiny to conventional oil and gas acreages. Sinopec, the discoverer of Fuling, won the Nanchuan block in July 2011. On its twitter-like micro blog, Sinopec said late on Tuesday that it accepted the penalty for fulfilling only 73 percent of the investment committed there, as the Nanchuan block contained a world heritage site and exploration work in the mountainous area proved tougher than expected. Henan Coalbed Methane Development and Utilization Co, a provincial-level coal-seam gas developer also received a fine of 6 million yuan for falling short of spending pledges on the nearby Xiushan shale gas block. The two blocs are about 2,000 square kilometres each and both are located near the southwestern city of Chongqing. Sinopec and Henan also handed parts of the two blocks back to the government. China's top energy giants, PetroChina and Sinopec, hold the majority and best onshore shale acreages, a factor that industry sources have said has delayed the progress in unlocking the country's unconventional gas resources. China's Sinopec Corp said on Monday it was committed to shale gas spending for 2015 despite a sinking global oil market to which domestic gas prices are linked. Falling oil prices will have no major impact on the company's plans for natural gas development, Jiao Fangzheng, senior vice president of Sinopec, told a news conference. Still, Jiao said it was unclear if the central government would continue a subsidy of 0.40 yuan per cubic meter for shale gas production beyond 2015, a key to sustaining early development of the costly unconventional resource. The country's second-largest state energy firm has taken the lead in developing China's potentially huge shale gas resources, having discovered the first large deposits at Fuling in the southwest. Sinopec has said the Fuling field重慶涪陵, which has so far produced 1.1 billion cubic meters (bcm) of gas, is on track to reach a capacity of 5 bcm by 2015 and 10 bcm in 2017. Fuling gas currently sells at 2.48 yuan (40 cents) per cubic meter, which along with the additional subsidy gives Sinopec an internal rate of return of 11 to 13 percent, a second company official said. Industry analysts believe global oil prices, which have lost nearly half their value since June, will eventually hit spending on expensive shale gas development, although state giants like Sinopec also take into account government priorities. "If oil prices remain at $60 for the next few years, then achieving 10 bcm will be a challenge," said Gordon Kwan, head of Asia energy research at Nomura. But if oil prices rebound to $80 and higher from 2016, then Sinopec's shale gas target could be achievable, as the government is expected to hand out more subsidies, Kwan said. The company forecast an average price of 4,320 yuan ($694) per ton for crude oil in 2014, Jiao said, but prices have fallen below 3,000 yuan ($482) in December, hitting revenue badly. Revenue from the exploration and production sector has probably fallen 10 billion yuan ($1.61 billion) this year, Jiao said. Shale gas exploration costs can be controlled at 70 to 80 million yuan ($12.85 million) per well, he added. Sinopec has said it applied new drilling technologies in the Fuling field and manufactured all the production equipment and tools domestically, which has held down development costs. A government announcement over the weekend raising the threshold for a windfall tax on crude oil production will also help ease the firm's tax burden. China Petroleum & Chemical Corp. completed the purchase of a 50 percent stake in a Kazakh oil producer from Lukoil for $1.09 billion, gaining full control of a venture with stakes in five oil and gas fields. The sale of Caspian Investments Resources Ltd. received the required permits from the state authorities of the Kazakhstan in late July, Lukoil said in a statement Thursday. The deal concluded after more than a year of talks and the price is less than the $1.2 billion agreed on in April 2014. “That’s a great piece of luck for Lukoil that Sinopec had closed the deal after all, given worsened expectations over the Chinese economy,” Maxim Moshkov, an energy analyst at UBS Group AG in Moscow, said by phone. State-owned Sinopec, as the Chinese producer is known, signed the initial accord with Lukoil as the government in Beijing pushed to diversify energy assets abroad to meet rising demand at home. The Russian producer accused Sinopec of breaching the agreement in February and sought damages through an arbitration process, which was halted in June. Sinopec and its parent company already own the other half of Caspian Investments Resources, which holds stakes in fields with more than 200 million barrels of proved oil and gas reserves, according to a Moody’s Corp. report published when the deal was announced last year. The Chinese joint venture bought its stake in Caspian Investments Resources in 2010. Lukoil retains stakes in the Tengiz, Karachaganak and Kumkol oil and gas fields in Kazakhstan and the Caspian Pipeline Consortium, making it the largest Russian investor in the country, according to the statement. Its share of production in the Central Asian nation was about 4.3 million tonnes of oil and 1.5 billion cubic meters of commercial gas last year. 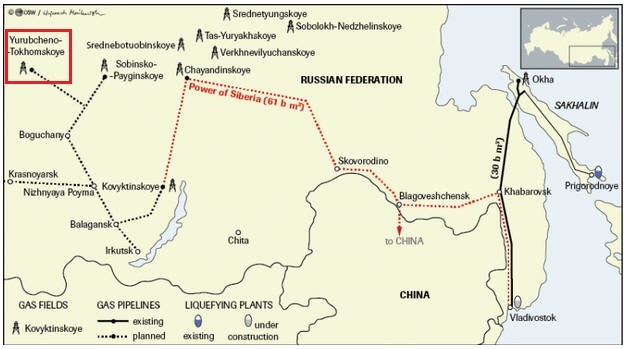 Under the agreement, Sinopec Group has the right to acquire a 49% stake in Eastern Siberian Oil and Gas Company (ESOGC) and Tyumenneftegaz, that hold the exploration licenses for Yurubcheno-Tokhomskoye and Russkoye fields respectively. Eastern Siberian Oil and Gas Company (a subsidiary of Rosneft) has started drilling the first gas-injection well at Yurubcheno-Tokhomskoye field. 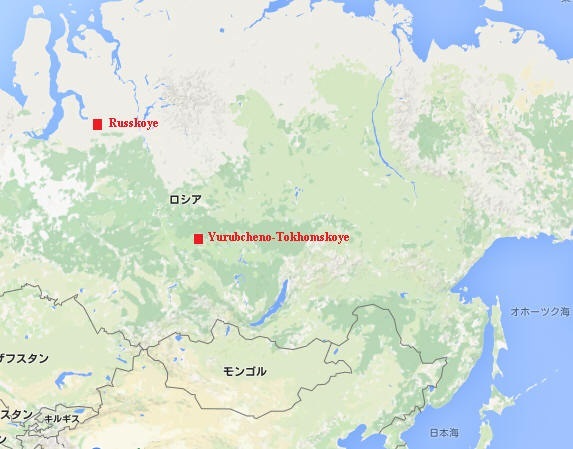 The Russkoye field is a heavy crude oil field located in the Tazovsky District, Yamalo-Nenets Autonomous Okrug, Russia. It is one of the largest fields in Russia. 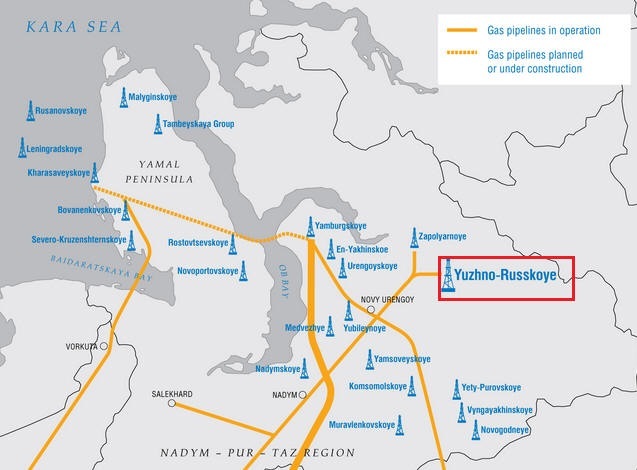 The field is developed by Tyumenneftegaz, a former subsidiary of TNK-BP and the current subsidiary of Rosneft. As a next step, Sinopec Group and Rosneft will set up a Joint Technical Group to finalize the investment plan and agreement. The closing of the transaction is subject to a number of standard conditions including approval from governmental authorities. Sinopec Group and Rosneft deeply value their partnership with each other. Both parties have achieved positive outcomes in the past in their cooperation on the Udmurtneft and Sakhalin 3 projects. China’s Sinopec Group plans to buy a share of Russian petrochemical major Sibur, the Russian firm announced Sept. 3, without disclosing details. Moscow-based Sibur said the two companies reached a “framework investment agreement” for Sinopec to acquire a stake in Sibur during Russian President’s Vladimir Putin’s state visit to China this week. The Reuters news service, citing a source close to Sibur shareholders, said Sinopec could acquire more than 10 percent of the Russian company. In the statement, Sinopec Chairman Wang Yupu said Sibur’s vertically integrated upstream and petrochemicals business complements Sinopec. The deal will “reinforce Sibur's expertise to maximize the efficiency of new large-scale projects and raise the Company to a new level,” he said. Reuters said Mikhelson would remain Sibur’s largest shareholder. The announcement said the deal is expected to close after approvals from corporate governing bodies and regulators. The announcement also hinted at the larger political picture, noting that it came during a state visit by Putin to China, to mark celebrations ending World War II 70 years ago. Wang also noted it fit into China’s new “One Belt, One Road” policy to build stronger ties with other countries in Asia, the Middle East and Europe. Besides some existing joint investments with Sinopec, Sibur manufactures low density polyethylene, polypropylene and synthetic rubber, along with plastics products including biaxially oriented PP film and expanded polystyrene. It said it has basic polymers production of 995,000 metric tons (2.19 billion pounds) per year and a little over a million tons (2.2 billion pounds) of capacity for products made from plastics and other materials. Sibur is also Russia’s largest processor of petroleum gas. It had 2014 sales of 361 billion rubles ($5.4 billion). BEIJING (Reuters) - Chinese state energy giant Sinopec Corp is in advanced talks on taking a controlling stake in petrochemical firm Dragon Aromatics, which operates one of the country's biggest chemical plants, three sources with knowledge of the matter said. The tough line shows how Beijing is putting pressure on provinces to ensure better industrial safety standards and protect the environment after a series of accidents has stirred protests from residents opposed to plants in their backyard. Dragon Aromatics, owned by Taiwan's Xianglu Group, was forced to shut the plant with a capacity to produce 1.6 million tonnes a year of paraxylene (PX), a chemical used to make polyester fiber and plastics, after the fire in April. "This is what the local government has insisted: without Sinopec's participation the plant won't be allowed to resume operations," said one of the sources, who declined to be named due to the sensitivity of the discussions. Sinopec could take up to 80 percent of the stake, the source added. Sinopec spokesman Lu Dapeng declined to comment. A senior Dragon Aromatics official said that he was not in a position to comment on the communications at the board level but told Reuters the firm was "trying every means to resume the plant's production as soon as possible." The PX plant is located on a peninsular called Gulei, part of Zhangzhou city and a site where state firms including Sinopec and China National Offshore Oil Corporation (CNOOC) had previously tried to build petrochemical plants. Calls to the press department of the Zhangzhou municipal government were not answered, while an official on the management committee of the Gulei economic zone did not respond to a fax seeking comment. Industrial safety has come under heightened scrutiny in China since a devastating explosion in August at a chemical warehouse in Tianjin port that killed 160 people. Sinopec, China's largest oil refiner and petrochemical producer, wants to build more PX facilities but at least two of its investments have been blocked over the last few years due to opposition from residents worried about pollution. "It would not be a bad deal for Sinopec, as it would save it all the trouble of going through the lengthy regulatory and environmental approvals," said a second source with a firm that has a supply agreement with Dragon Aromatics. In Fujian, local officials including a vice mayor have been punished over April's accident, which was blamed on lax quality control and safety management, according to a report on the state news agency Xinhua in August. Sinopec, regarded as a seasoned petrochemicals operator, may need to retool the plant to improve safety standards, the sources said. The purchase could also allow Sinopec to increase its purchases of Iranian oil as sanctions are relaxed. To supply the PX plant, Dragon Aromatics also runs a 100,000 barrels per day condensate splitter and a 3.2 million tonnes per year hydrocracker at the site. Dragon Aromatics has been one of the biggest buyers of Iranian condensate, a very light crude oil, and the plant shutdown has forced the Middle Eastern producer to store more of its oil. Summary：A controversial paraxylene plant in Fujian exploded in the earlier hours of July 30, 2013. Although no casualties or chemical leaks have been reported, the incident has added fuel to an ongoing debate about the safety of PX plants. An explosion ripped through a paraxylene (PX) plant in Zhangzhou, 漳州市 Fujian Province at around 5am on July 30. According to local authorities, no casualties or chemical leaks have been reported and the plant did not suffer heavy damage. An initial investigation indicates that the fire was triggered by a crack that appeared in a hydrogen pipeline during a pressure test. News of the explosion broke when a Sina Weibo user posted images of the fire at the plant to their account at 4:57am. In January 2013, construction at the Zhangzhou plant was halted and Xianglu Tenglong Group (翔鹭腾龙集团), the company developing the plant, was fined 200,000 yuan by the Ministry of Environmental Protection (MEP). Sinopec Group, China’s super large petroleum and petrochemical enterprise group has started construction of a long-planned ethylene complex in the southern city of Zhanjiang. The mega project, which includes construction of a refinery, is being built on the basis of a preliminary agreement as part of a 50:50 venture with the OPEC member Kuwait. The ethylene complex is likely to be completed by 2020. The first phase of the mega projects will have an 800,000 tons per year ethylene complex that produces synthetics, plastics, rubber and fiber a 10 million tons per year refinery, the refinery is likely to be put into use a year earlier, Sinopec said. The mega projects are expected to involve investment to the tune of 5.9 billion yuan ($848.76 million), of which 3.8 billion yuan ($546.66 million) investment will be done in the first phase. China's state-run energy giant Sinopec and a Taiwanese firm started construction this week on a petrochemical plant in Fujian province, said Reuters. Taiwanese firm Dynamic Ever Investments Ltd 旭騰投資有限公司　has partnered with Fujian Petrochemical Company Limited (FPCL), which is 50-percent owned by Sinopec Corp, to build the facility, the China Petrochemical News said. The plant, located on the Gulei peninsula in Zhangzhou, Fujian province, will process up to 1 million tonnes of ethylene when completed, the paper said. The site will includes 16 chemical units and a dock and is expected to be partially completed by 2018, the paper said. Sinopec did not immediately respond to a request for comment. Contact information for Dynamic Ever Investments - a joint venture of seven Taiwanese companies - was not immediately available. Ethylene, a key building block for synthetic rubber, plastics and chemical fibre, can be processed from refined oil products such as naphtha and liquefied petroleum gas. The paraxylene (PX) refiner suffered two major fires in less than two years at the USD3 billion plant. Also nearby in the same province, Sinopec operates a 240,000 barrels-per-day oil refinery and a 1 million tonne-per-year ethylene complex. Dragon Aromatics, owned by Xianglu Group, a Taiwanese petrochemical group, is one of the largest independently-run PX producers in China. China's Fujian Gulei Petrochemical plans to startup a new 600,000 mt/year ethylbenzene-based styrene monomer plant at Zhangzhou city in 2020, US-based technology provider Badger Licensing said late Monday. The SM plant will be part of the Gulei Refining Integrated Project, an integrated refinery and petrochemical complex, Badger said in a statement. "Basic engineering design work is about to begin, and the plant is scheduled for mechanical completion and startup in 2020," Badger said. The SM plant, which will be located at the Gulei Economic Development Zone, in Zhangzhou city, Fujian province, will use Badger's proprietary EBMax technology. Fujian Gulei Petrochemical is a joint venture of Dynamic Ever Investments Ltd. -- a joint venture of Taiwan shareholders -- and Fujian Petrochemical Co. Ltd. -- a joint venture of China's Sinopec and Fujian province. Badger has recently been awarded several SM plant contracts in China, including Zhejiang Petroleum & Chemical's 1.2 million mt/year SM plant, which will be built on Daxiaoyushan Island, in Zhoushan city, Zhejiang province. The new plant, which will be one of the largest SM plants in the world, is scheduled to startup in 2018, according to a statement released by Badger in September 2017. China's Hengli Petrochemical has also selected Badger's technology for a 720,000 mt/year SM plant in the Changxing Island 長興島economic zone in Dalian city, Liaoning province. The plant is expected to startup in 2019, the licensor had announced late March.